Demolition of an area of the home can seem fun and is usually the first step in any renovation project. 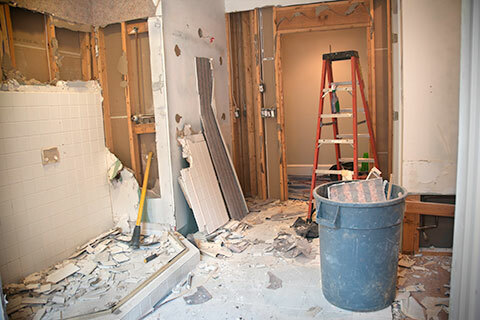 Whether it be working on the exterior of the home or the building on your property, such as the garage in the backyard or preparation for a new addition, kitchen or bathroom renovation – a DIY demolition presents many challenges. DIY-ing your demolition can be a mistake if you have no idea what you are doing. Every demolition project needs to be planned out so that the area can easily be cleaned, and no accidents occur. So, what can go wrong with a demolition project? And how can you avoid mistakes? Before DIY demolition starts, as a homeowner, you may be making a mistake by not sealing off the demolition area properly. This can be especially bad if the demolition is occurring inside your home. When demolition begins, plaster, drywall, and other materials will be flying through the air. If you do not seal off any doorways into other rooms, you end up with a huge mess spread throughout your home. Plastic sheeting and tape or other materials need to be used to seal off the space so that you only have one area to clean. When completing a demolition project in the home, any electricity or plumbing running through the space will need to be shut off. Especially with electricity, this can be very dangerous. The electricity needs to be shut off so that no one is electrocuted during the demolition. The water should be shut off in case plumping pipes are removed. As well, this helps to avoid any water damage if a pipe is hit during the demolition. Many homeowners forget to shut off their utilities and this can result in damage to your home, or injury or death when not taken care of correctly. When dealing with outdoor DIY demolition, there are other mistakes that can be made. Take, for example, tearing down a storage building. The building’s structure will need to be disassembled in a certain way so that the area can be cleaned correctly. If not, you may end up with a huge mess as the building will fall into itself. The best and safest way to avoid any issues with a DIY demolition is to hire the experts at Kloos. We specialize in residential demolition services. Along with the physical benefits of not completing the demolition yourself, you’ll be able to focus on other details of your DIY project. Our team can concur most demolitions within 1-2 days. After demolition, we have other complimentary services, such as junk removal and hauling. Make it easy on yourself, make it a Kloos call today – 204-955-1188! Posted in Blog and tagged Debris Removal, Garage Demolition, Hauling Service, Home Renovation, Junk Removal, Residential Demolition.